Customers: These coins are available from years of our choice, all of which will be from 1856-1889. Coins will be chosen based on our current inventory, however, all coins have been professionally cleaned. 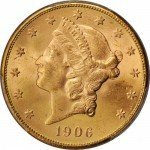 Showcasing Lady Liberty as a Native American princess, Indian Gold Dollars are unique coins in American history. 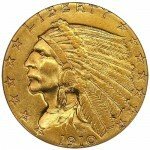 Silver.com is happy to offer these Type III Indian Gold Dollars in cleaned condition. A distinctive coin, the Type III design was introduced in 1856 and was finally discontinued in 1889 along with the rest of the series. 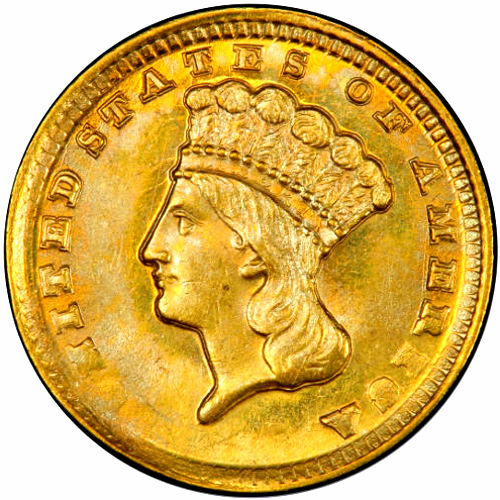 The unique $1 gold coin began to be produced by the United States Mint in 1849 and saw 3 revisions during its time in circulation. The type III version pays homage to the country’s Native American past, but is also a tribute to Alexander Hamilton’s early wish to see $1 coins minted in silver and gold. During Hamilton’s lifetime, Congress granted the minting of silver dollars, but not gold. 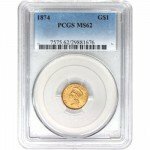 The California Gold gave the country the gold it needed to mint these illustrious coins. The design of the Indian Gold Dollar Type III is noted for its large profile of Lady Liberty. She is adorned in an Indian headdress that is spectacular for its detail. The design was produced by James B. Longacre, the well-known American engraver. Lady Liberty is encircled with the inscription ‘The United States of America.’ The reverse side of the coin lists the denomination, 1 dollar, situated within a wreath. The exceptional detail of these coins makes them highly collectible. Silver.com will send random years of the Type III issue based on our inventory at the time you place your order. These coins are a wonderful way to obtain small amounts of gold to support your investment in precious metals. To insure your order is mailed securely, we ship all orders fully insured with tracking. We also require a signature upon delivery of items exceeding $300. Call Silver.com at 888-989-7223 if you have questions about the Indian Gold Dollar Type III (Cleaned) or any of our other products. Feel free to contact us through email or our live chat as well. 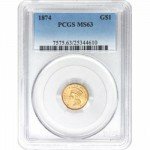 These historic gold coins make excellent investments and reflect their era of mintage with their magnificent design. Be sure to obtain yours while our supplies last.